Before Honored Kid Emma Sophia was 2 years old, she was in a fight for survival after being diagnosed with leukemia. 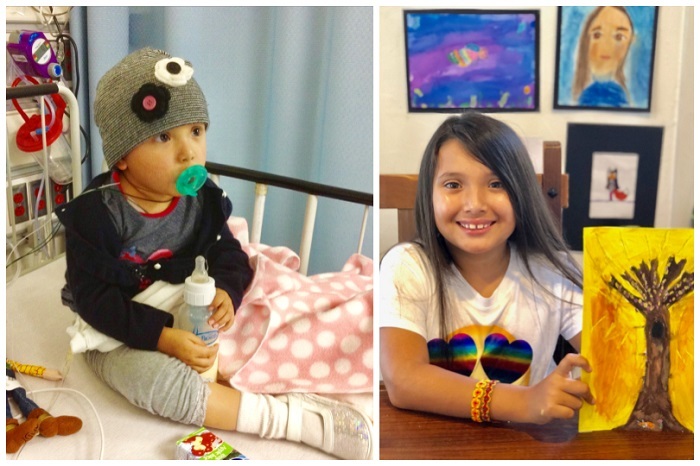 Now 7 years old and two years past treatment, this amazing kid is sharing her story to inspire others to support childhood cancer research — like the lifesaving research funded by the St. Baldrick’s Foundation and Stand Up to Cancer. (Left) Honored Kid Emma Sophia in treatment as a toddler. (Right) Emma Sophia is now 7 years old, in remission and aspires to be an artist, a veterinarian and a chef. Emma Sophia was barely 20 months old when she started limping at a family party. While the rest of her friends were running around and chasing one another, this little girl could hardly walk. All she wanted was for her daddy to hold her. 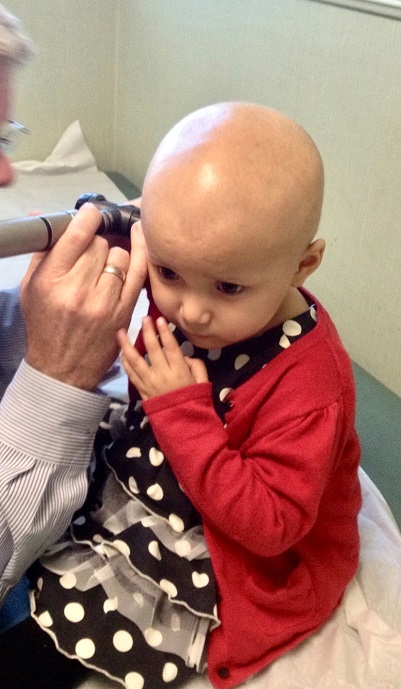 Emma Sophia is examined by a doctor during treatment for ALL. When her limping got worse, the girl’s parents took her to the doctor for an x-ray. Perhaps she’d fallen when she was out of their sight, they thought. But the x-ray was clear. It wasn’t a bump, bruise or break. It was childhood cancer. She had acute lymphoblastic leukemia (ALL), an aggressive, high-risk form of blood cancer and her treatment would last three years. That day, Emma Sophia started treatment, and Letty and Joey began to fight for their daughter’s life. Emma Sophia endured five different types of chemotherapy, multiple rounds of steroids, and 22 lumbar punctures. The combination of steroids and chemotherapy was especially rough on their little girl, causing painful mood swings. When the torment got to be too much, Letty would try to soothe her daughter by driving her around at night for hours. Now in remission, Emma goes to school, is learning to swim and loves to take care of her family’s backyard chickens. 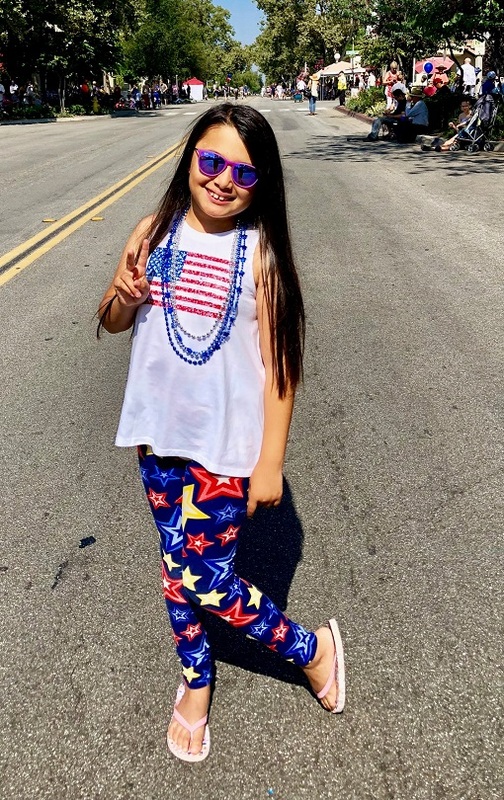 If that wasn’t hard enough, Emma Sophia was often isolated from her friends and family because her immune system was compromised by treatment. She couldn’t go to the park or preschool or play outside with her friends. It was lonely, but now that tough time is a memory. Today, Emma Sophia is in remission. She’s a thriving, vibrant and creative 7-year-old who is finally learning to swim and fills her home with art. She goes to school, sings, dances and relishes taking care of her family’s chickens. She wants to be an artist, a veterinarian and a chef when she grows up. But as is the case with childhood cancer, remission doesn’t mean the journey is over for Emma Sophia. She suffers from many side effects from her treatment, including nerve damage in her hands and feet and avascular necrosis, which is the death of her bone tissue. She’s often sick with colds and feels fatigued. 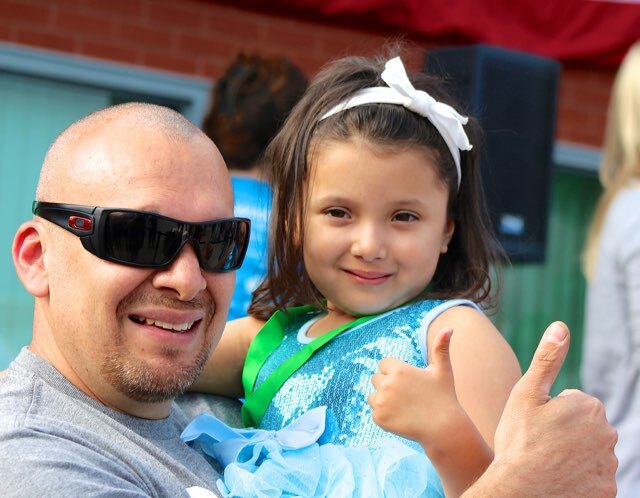 Emma Sophia’s dad, Joey, shaved his head with St. Baldrick’s in 2015 to raise crucial funds for research. Despite all of this, Emma Sophia and her family are hopeful for the future – and they want other childhood cancer families to have that same hope. That’s why Letty and Joey are doing everything they can to promote childhood cancer research. This Childhood Cancer Awareness Month, give kids like Emma Sophia options — give them hope. Fund lifesaving childhood cancer research today.